I hate to post bad reviews. We had not eaten at Kunkel’s Seafood and Steakhouse in several years because we had a rather lackluster visit our first time. When an impromptu visit from our oldest daughter and her fiance had us looking for something different for dinner, we decided to give the place a second try. 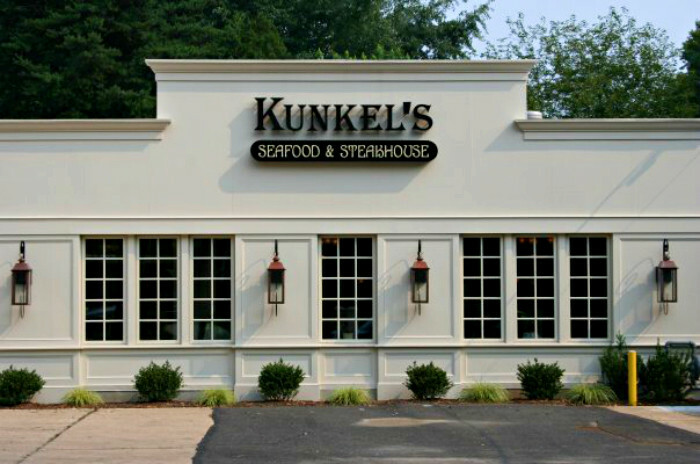 Our second visit to Kunkel’s Seafood and Steakhouse was more unsuccessful than the first one, and for a meal as pricey as this one was, we felt a written review was in order. To begin with, the restaurant bills itself as having a fresh raw bar, and Jim and the girls were all mouth-watering geared up for some fresh oysters. We were seated, and after a few minutes (a bit longer than I think was appropriate), a waitress came over to take drink orders. She disappeared again, and a few minutes later, returned to go over specials. I’ll get to that in a moment. Jim asked, as instructed by the menu, which fresh oysters they had in today so he could place his raw bar order, and it wasn’t until this moment when she “remembered” to tell us that they had no raw bar today. The delivery truck never showed up. Does that ever happen? It leaves one wondering if there is an outstanding bill or a bad relationship with a supplier that would cause a delivery to just not show up. Disappointment was obvious, and after dinner, Jim said he really would have walked out at that point if he thought the rest of us would be okay with it. I kind of wish now he had walked out. So, let’s get back to the specials. This is a steak and seafood restaurant. Tonight’s special was cheese ravioli with spicy (not really) sausage sauce. Interesting. Are they also an Italian restaurant? We place orders for appetizers that we think we can share around the table. We chose Fiery Thai Calamari, Stuffed Meatballs, and Bruschetta. We’ll start with the Fiery Thai Calamari. Described in the menu as “Crispy fried calamari tossed in a spicy-sweet orange chili sauce with fresh scallion also available in our Classic Fried Calamari style with marinara dipping sauce”, we opted for the spicy-sweet orange chili sauce instead of the classic fried calamari with marinara, which, after all, is not Fiery Thai Calamari. The calamari were just slightly chewy, with a pleasant sweet flavor, but there was nothing fiery or spicy to balance the sweet. This worked well for me, as I don’t really enjoy very spicy food, but if you are advertising a dish as “fiery”, there should maybe be a little heat attached? 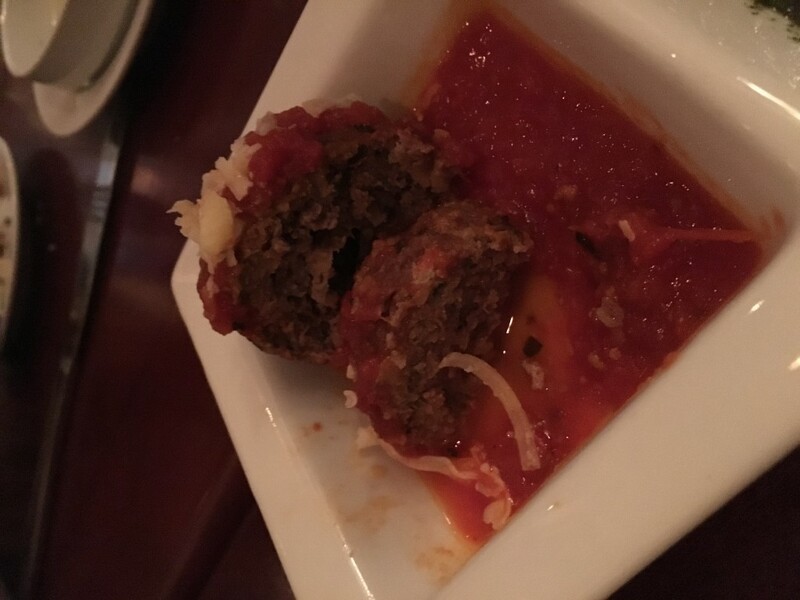 Next up were the stuffed meatballs. This is where we start to notice the “false advertising”. No raw bar, no fiery in the fiery Thai calamari, and no stuffing in the meatballs. The plate contained two large-ish meatballs, already topped with marinara sauce, separated in the middle by a shallow (very shallow) pool of pesto. I’m not sure what purpose the pesto served, as it was barely detectable when added to the already marinara sauce covered meatballs. But the biggest disappointment was the lack of smoked mozzarella. 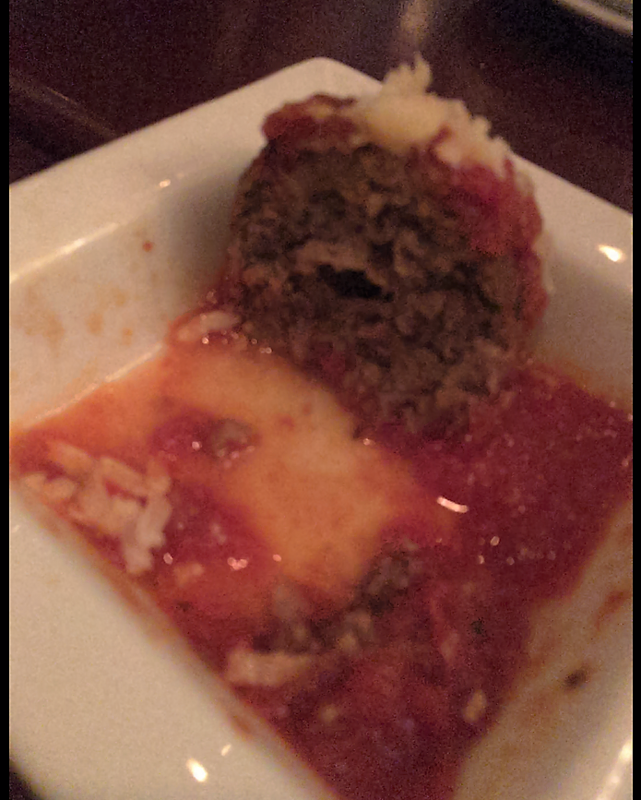 Had it melted into the meatball as it was cooked, surely it would have imparted a smokey flavor to the meat. Instead, the meat was a bit on the bland side, although the marinara sauce was tasty. Next up, bruschetta. Whenever I’ve had or made bruschetta, it has been on toasted bread. That seems to be a key ingredient to actually making bruschetta, and it prevents the ingredients that you pile on top of the bread from making the bread too soggy to be picked up. To begin with, this bread was not toasted. Even though the description in the Kunkel’s menu says this: Grilled sliced French bread toast points topped with diced tomatoes, onions, and basil and olive oil. – what we actually got was just sliced, fresh bread. It was hard to pick it up to eat it, as the ingredients were too much for the untoasted bread to handle, and the bottom of the bread was a bit on the soggy side, which made it unpleasant to eat. 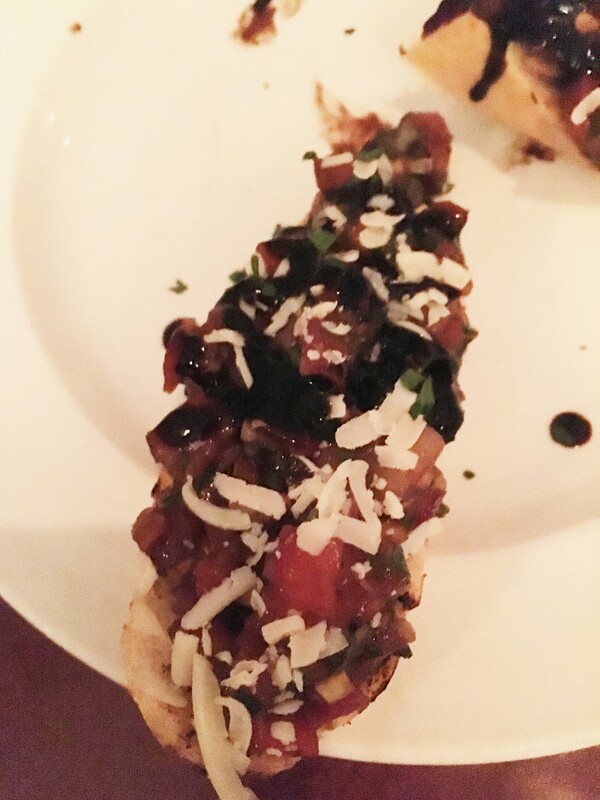 To make matters worse, the whole thing was drenched in balsamic glaze, which gave everything on top of the bruschetta an overwhelmingly vinegar taste. I was glad not to have eaten this first, because I would have been unable to taste any of the other appetizer offerings (but maybe that would have been a good thing). We waited no less than 20 minutes from the time our appetizers were finished until our salads and soups were delivered. Every entree here comes with a house salad, which takes some of the sting out of the steep prices, but the salad is uninspired on it’s best day. You can substitute the house salad for any of the other more interesting salads on the menu, but our waitress told us there was an upcharge of $5 to do so. Jim and Brighid opted to choose a Caesar salad, and while it was clearly a better choice than the regular house salad, had they actually upcharged me $5, I’d be pissed. I don’t know if the waitress simply forgot or if she felt guilty charging $5 more for the Caesar salad. They don’t call it Caesar salad at Kunkel’s, it’s a Sante Fe Romaine salad – basically a Caesar salad with a sliver or two of red pepper, a couple of olives, and a Chipotle Caesar dressing. There wasn’t anything wrong with the Caesar, and the dressing was quite tasty, but had they charged me $5 more for essentially the same plate of lettuce with fewer toppings, I’d really have had a fit. I don’t recall how long it took for entrees to come, but I do know that in the amount of time it did take between salad and entree, Eilis had long finished her glass of water and was well into my glass of iced tea. For a virtually empty restaurant, there is really no excuse for glasses to remain empty so long. The entrees are beautifully plated, and would easily impress the Chopped judges on their most critical day. It’s there, though, that stuff started to go south. Granuaile had the crab cakes. Now, I have to say, we are sort of crab cake snobs. My Aunt Annie, who for many years owned and cooked for a restaurant in the Outer Banks of North Carolina, made the best crab cakes known to human kind. As soon as I see red pepper in a crab cake, I know that the person who made them was trying to cut corners and save money by throwing in some kind of filler. To be fair, the crab cakes weren’t awful. They were, however, just blah. 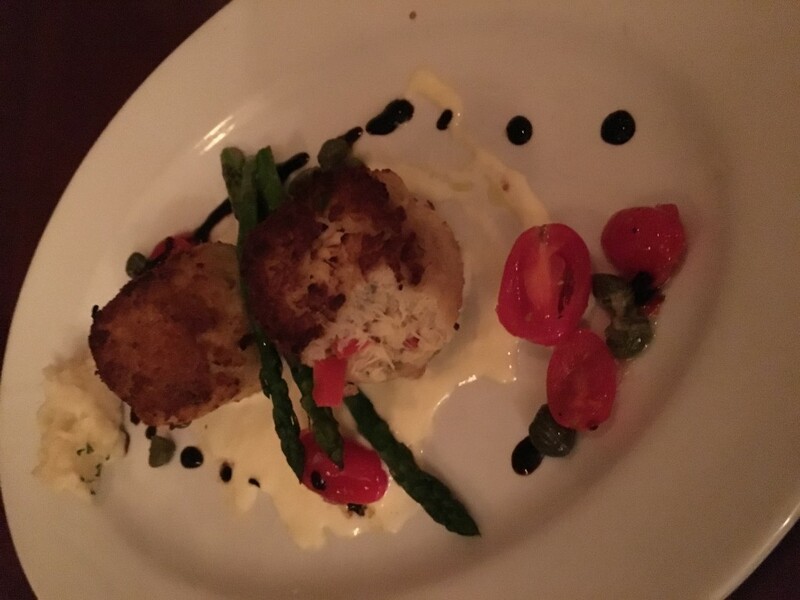 There was too much other stuff besides crab in the crab cake, and there again is the overwhelming balsamic glaze. The sauce underneath the crab cakes was really tasty, and it was a shame to ruin in with the vinegary drizzle. The crab cakes came with a side of asparagus, which you can see was more of a middle of asparagus, featuring three thin stalks of perfectly cooked, blandly seasoned vegetable. 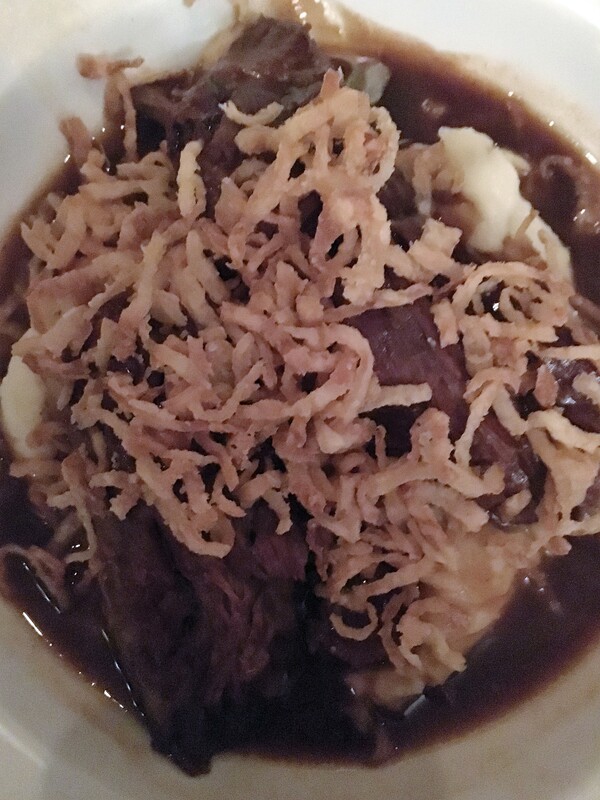 I ordered the beef short rib, promised to be served over a bed of mashed potatoes, and finished with a bordelaise sauce and frizzled onion. I saw the mashed potatoes, but the sauce was more of a soup, and the potatoes were already trying to stay afloat with the abundance of frizzled onion holding them down. The beef itself tasted fine, but was overcooked and chewy. The frizzled onion was too much to be considered a garnish, but added an off putting texture when combined with the already challenging to eat beef. I ended up switching my entree with Jim out of fear that the beef and my gastrically altered stomach would not get along. Jim ordered (and I ate) the ravioli special. These were a cheese ravioli with what was billed as a spicy Italian sausage sauce. 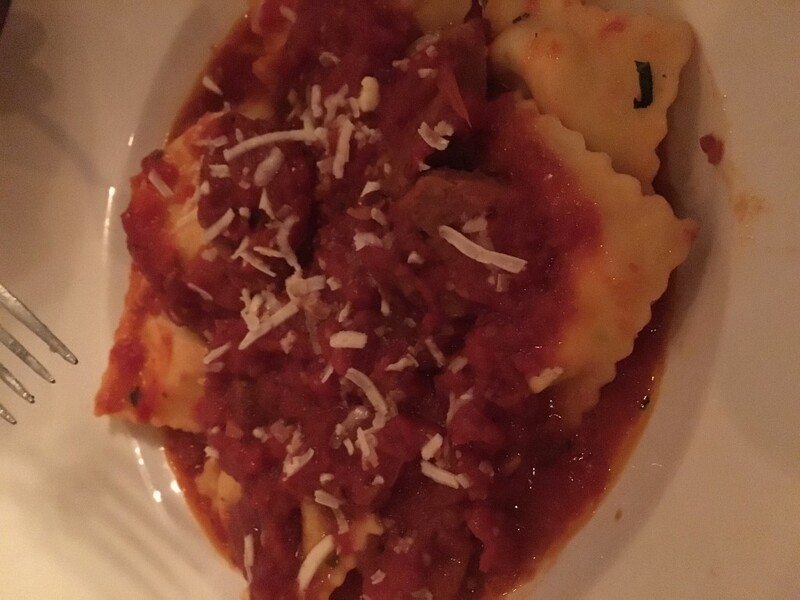 The ravioli were light with a creamy cheese filling and a really good – although not spicy in any way – marinara sauce. There were a few discs of spicy Italian sausage in the dish that were too spicy for me to really enjoy, but it begs the question that if the sausage had been simmered with the sauce, why did it not impart some of the spicy flavor to the sauce? Was it just tossed on top as an afterthought? As you can see, based on other Italian restaurants in our area, the price for this ravioli dish was WAY out of line. While this was easily the best dish of the night, there’s no way this dish should have been $30. Eilis’ dish of Pasta and Mussels was deemed really good. 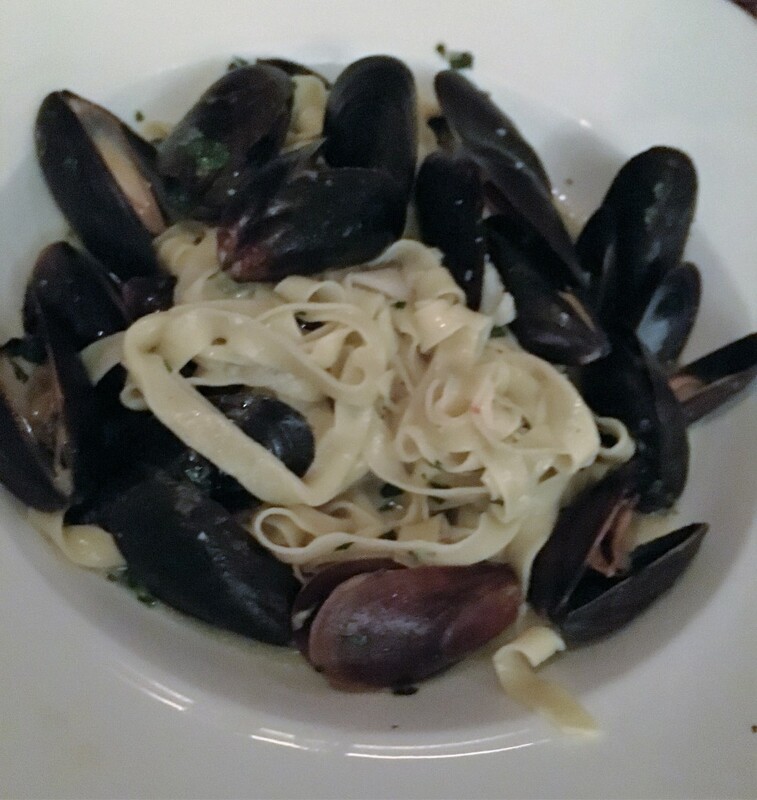 The pasta looked and tasted fresh, and the mussels were quite good in the butter and garlic sauce. The pasta could have used a bit more sauce, and then a nice roll to sop it up with, but the meal was good and probably more in line with the price of similar dishes at other restaurants ($23.00). Two questions, though, if there was no delivery of fresh seafood yesterday, are the mussels frozen from a previous delivery? And why is this plate of seafood and pasta $7 cheaper than cheese ravioli? Brighid and Brent enjoyed the filet mignon and the apricot butter salmon. Brighid’s steak was under seasoned, and after the rest of the evening’s disappointments, she had begun to mentally eye up her stop for a Sonic Blast on the way home. She ate a few bites and packed the rest for Jim to eat later. Brent’s salmon was resting in a warm sea of apricot butter that was sweet and salty and a great combination to accompany the dense fish. It was also one of the few highlights of the night. Bogged down by disappointment, we ended the evening without even looking at the dessert options, however, it was a long wait from the time the busboy boxed up our leftovers to the time where we were actually offered dessert. Then came the tacky move of the evening. Our waitress came over with our check, and announced at the table that if we would be paying cash, we had to let her know right this very minute now, because cash paying customers were given a 3% discount on their food purchases. Really? This again brought to mind concerns about the financial stability of what is supposed to be somewhat of a casual elegant restaurant. 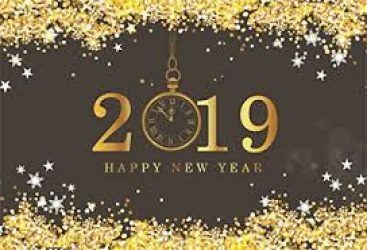 We won’t be back to Kunkel’s at any time in the near future, and while the restaurant itself is just beautiful, you can’t tease me with decor and not back it up with food.